Say “St. Augustine” and you might instantly think of its designation as the oldest continuously occupied European established city and oldest port in the continental United States. However, if you told me that the city was founded by Ponce de Leon on his search for the much ballyhooed Fountain of Youth I’d have to pull out my big red marker and place an X on that lovely forehead of yours. No, the credit of founding St. Augustine does not go to Ponce de Leon. In fact, the idea that he even landed on the North American continent at St. Augustine is still heavily debated by many history scholars. While some argue St. Augustine was the place others believe he came ashore south of St. Augustine at a place known as Ponce de Leon Inlet or even further south at Melbourne Beach in 1513. Yes, old Poncey was looking for the Fountain of Youth but even that is debated since there is no known connection between Ponce de Leon and the supposed Fountain of Youth. The dots were connected by history writers after his death and the facts are on shaky ground. The credit for founding St. Augustine goes to Pedro Menendez de Aviles in 1565. He was a Spanish admiral and pirate hunter. You might tell me that St. Augustine was attacked by the British in 1702 and again in 1740 by the colony of Georgia’s own James Oglethorpe as he led the British in the Siege of St. Augustine during the War of Jenkin’s Ear. Yes, an ear….men will fight a war of every little thing, won’t they? You might want to remind me St. Augustine had the first free community of ex-slaves in 1738 or that the city was in the hands of Loyalists during the American Revolution serving as the location where three signers of the Declaration of Independence cooled their heels on the British dime. You might want me to remember the large number of Greek settlers in the area or the Minorcans whose story resembles that of the Cajuns in Louisiana. You might want me to remember St. Augustine as the location of the fortress Castillo de San Marcos which was built by the Spanish and later renamed Fort Marion after Francis “Swamp Fox” Marion of American Revolution fame. Over time the fort housed such notables as Osceola, John Horse, and the daughter of Geronimo was born at Fort Marion. A modern thinking person such as yourself might want me to know St. Augustine became a winter resort of the wealthy due to Henry Flagler and his railroad. You might even want me to know that St. Augustine abounds in little known and untold Black History that has only come to light in recent times such as the fact that the U.S. Signal Corp had a training facility there that trained the Tuskegee Airmen. So, I’ve been silent for a bit around here. Lots going on at my house….sending out graduation notices for my son, sending out 50th birthday invitations to family and friends (yes, I know….it’s hard to believe…ElementaryHistoryTeacher is married to a 50 year old man…amazing), and it seems every time I think I have a moment to post someone decides I need yet another thing to do. Well, I’m here to tell you the old saying is true, and my family and friends seem to agree with it….When you need something done hand it off to a busy person. Yes, I’m trying to overcome mountains of things to do, but you know me….I always have some historical thought going on in that busy brain of mine and this time is no different. I’ve been thinking about my ancestors and all of the folks who arrived in the American colonies in the 1700s and decided to trek into the Appalachian Mountains. During the early days of colonization in North America the Appalachian Mountains served as a barrier to expansion for the British colonies. On the flip-side, however, and something I love to explore with students, is how the same mountain chain that hindered and challenged my ancestors also served as a hedge of protection for Native Americans. Several factors contributed to this – the mountains formed a continual, unbroken chain with numerous confusing ridges, never-ending forests and undergrowth that can hide so many rewarding vistas – and of course, an alliance system the English formed with Native Americans kept a large number of colonists at bay until after the American Revolution. Recently, my husband and I left Atlanta and traveled to Asheville, North Carolina for a couple of quiet days. Once again the beauty and majesty of the mountains washed over me, and I couldn’t help but think of those early settlers. We traveled through the ridges and valleys quite well across well traveled and maintained roads – roads that did not exist when the colonists began the arduous task of entering and traversing the mountains. I kept myself busy during the trip taking pictures and video and have placed some of the images here in the slideshow below for your enjoyment. Here are some of the other paintings in the series…a series of thirty paintings…and more information regarding this interesting artist. 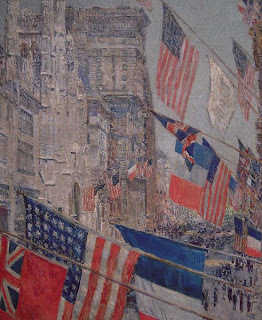 Hassam became interested in expressing his patriotism for the United States during the days leading up to our involvement in World War I. Patriotic paintings were used to counter the isolationist point of view expressed by President Woodrow Wilson and others prior to 1917. 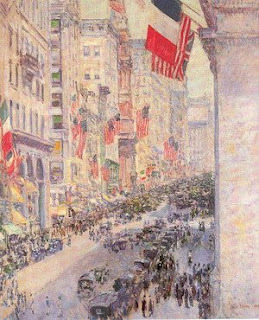 In fact, at one point Hassam wanted to go to Europe and paint scenes from the battlefront, but the U.S. government would not approve the trip. At one point he was arrested for sketching naval maneuvers along a river….. Many of the flag pictures were donated for the war effort. 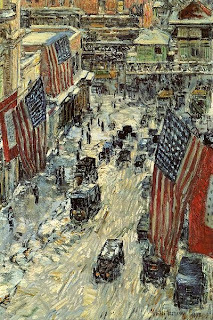 Hassam accepted Liberty Bonds for payment regarding one of the paintings. 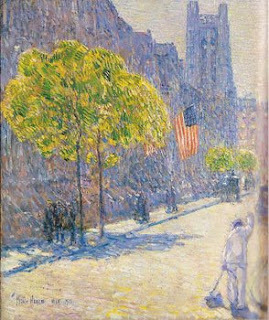 Hassam’s goal was for the entire series to be sold as a war memorial, however the paintings were eventually sold individually after several group exhibitions. More of the paintings can be seen at this link. 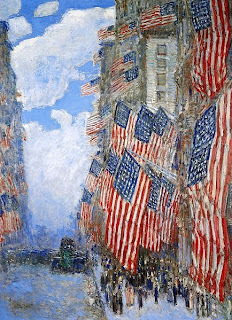 One of Hassam's best known works in the flag series, Avenue in the Rain, remains part of the White House collection. I've posted it over at American Presidents Blog here. Happy Fourth!......and fly those flags, please. What makes a good plot line for a story? First I think you need interesting characters….people you can care about….people you are willing to invest a few minutes of your time with. Second, you need an interesting backstory…something going on in the background to move the story along …throw in a little true life to the characters and to the events of the back story and gee, you’ve got a genuine blockbuster. That’s what I look for when I teach history standards. In and of themselves the standards can be a little boring. Teaching in a “just the facts ma’m” kind of format will more often than not lead to a room full of students with glazed over eyes and off task behaviors…doodling, throwing spit balls, reading ahead in the text, repairing make-up, etc. I look for the details of history that will enthrall others, old and young alike, the quirkiness of history, the stuff of history that make it alive and worth remembering. The Civil War is a historical topic full of facts and my Georgia teaching standards are quite clear as to what students should know when they tackle that test each April. The Civil War is also a historical topic that is jam packed with great backstories and wonderful, real characters that can be used to motivate students to delve deeper into the content and analyze the context of the times and the motivation behind all of the parties involved. The story of the CSS Hunley is interesting not just from a naval and technological viewpoint, but since I have to consider my audience and what will drag them kicking and screaming to the historical roundtable, the story of the Hunley is a gem for any serious teacher of history. Last week for my wordless post I presented the front view of a gold coins that seem simple enough at first glance, but oh….what a story these gold coins have to tell. Homeschooling Granny made a correct assumption that the coins I pictured were indeed the coins given to George Dixon by his sweetheart Queenie Bennett as he left for war. Highlighting literature is an important part of my teaching style and the book The Story of the H.L. Hunley and Queenie's Coin Edition 1. (True Story) by Fran Hawke and illustrated by Dan Nance (2004) is a wonderful story to share with history students from 9 to 90. Throughout our great history men have gone off to serve our country and have received parting gifts from their loved ones. George Dixon was no different. During the Civil War many soldiers received miniature paintings or photographs of their sweethearts, a handkerchief, scarf, or a tender love letter. As he left in 1862 to join the 21st Alabama Regiment to serve under General P.G.T. Beauregard George Dixon’s sweetheart, Queenie Bennett, handed him a $20 gold coin. George instantly placed the coin in his pocket where he carried it into war. Can’t you see him sitting around a campfire at night pulling out the coin, turning it over and over in his fingers, thinking of Queenie….thinking of home? What was given as a token of love actually served many more purposes. On April 6, 1862 at the Battle of Shiloh the coin actually stopped a bullet from injuring his leg. Dixon would have a lasting limp from the injury, but he survived because of the coin. When he returned to Mobile he had the coin inscribed….Shiloh, April 6, 1862 My life preserver GED…and he continued to carry the coin in his pocket as a symbol of his love and devotion to Queenie as well as to commemorate his experience at Shiloh. Dixon was unable to return to the battlefield, but continued to serve the Confederacy. He volunteered for another duty working with a new type of weapon the Confederacy was investigating….a new type of boat called a submarine. The Confederates hoped the submarines would allow them to bust the blockade that had blocked Charleston’s harbor as well as several other Confederate harbors. Learning and experimenting as they worked, the men molded iron plates into a sleek shape. There would barely be room for eight or nine men, sitting on a wooden bench, turning the shaft that moved the propeller. A long pole was affixed to the front of the submarine. It would hold an explosive, which would be jammed into the hull of an enemy ship. Then, of course, as stories often do the plot returns to love. After a couple of disasterous tests George shared with Queenie that he was going to request command of the Hunley. He felt certain that the South should use submarines. He stifled any fear Queenie might have regarding his safety by reminding her he carried her gold coin. Under George Dixon’s command the Hunley was finally ready to attack Union ships in Charleston Harbor on February 17, 1864. The book continues with a discussion regarding how the Hunley attacked the 200-foot-long USS Husatonic, and how the Hunley tore a hole in the side of the Union ship and sank her. Sadly, however, the Hunley never returned to port. The Confederacy tried to keep the loss of the Hunley secret, hoping that the Union would fear more attacks. Any hope of ending the Union blockade ended with the missing submarine and Queenie’s George. Over the years quite a few myths surrounded the Hunley and her disappearance. PT Barnum, a late nineteenth-century circus owner, offered a reward of $100,000 to anyone who could find the Hunley for him to display in his traveling show. More than 100 years after the Hunley disappeared, famed author, Clive Cussler, arrived in Charleston to begin his search for the submarine. He was a Civil War expert, an underwater archaeologist, and an author. “Shipwrecks,“ he liked to say, “are never where they are supposed to be.” Cussler and his team kept looking, on an off for 15 years. The Hunley was finally located on May 3, 1995 but it was not raised until August 8, 2000. The book goes on to detail the painstaking efforts the folks at the Warren Lasch Conservation Center in North Charleston, South Carolina made to excavate the Hunley’s secrets…the propeller shaft, the crew’s bench, the men’s clothes, pipes, pocketknives, canteens, a wallet, a brooch, and a corked bottle. The remains of the crew members were also gathered for a proper buriel. But what of Queenie’s gold coin? Maria Jacobsen, the chief archaeologist sifted through the area where Lt. George Dixon would have sat. Through the mud she saw the glint of the lucky gold piece. The coin is displayed today at the Hunley Exhibit at the Warren Lasch Conservation Center. Fran Hawke’s book is a perfect addition to any history classroom and can be used with any age group. The story motivates students to learn more about the submarine by drawing them into the tragic love story of Queenie and George, by strategically interchanging the back story and the historical record back and forth in such a way you are totally unaware that you are learning something. You can see both sides of the coin here.